Insulated Access Doors - A variety of access doors are available in the same quality construction and material selection as the APT-O-LITE™ panels. All access doors are factory mounted so that the pressure differential of the enclosure will assist in seating the door against the heavy neoprene seal gasket provided around the full door perimeter. Heavy duty hinges and cam lever latches, operable from both sides, are standard features on all access doors. Optional windows are available in all access door designs. The Type ENT door is a factory-installed, high pressure, no-thru metal, foam-insulated door that utilizes an extruded aluminum frame. The door matches the construction of the foam panel enclosure using the extruded aluminum joiners. View enlarged photo + detailed drawing of Type ENT showing access door dimensions. This Type DI door has the same features as the Type ENT door and offers the advantage of also being easily field-installable into existing enclosures. View enlarged photo + detailed drawing of Type DI showing access door dimensions. The Type FPY door is a medium pressure, foam-insulated door, which utilizes a thru metal fabricated frame, for use in installations where aluminum may not be desired. View enlarged photo + detailed Drawing of Type FPY showing access door dimensions. 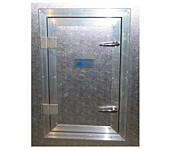 The Type FBB door is a low pressure door that is insulated with builder's board instead of foam. It also utilizes a thru metal fabricated frame. Coming Soon - View enlarged photo + detailed drawing of Type FBB showing access door dimensions. The Marine Door is a non-insulated, cast aluminum door with a standard view port. This 18" x 30" heavy duty door creates an air and water tight seal and is used for access to the spray chamber of an air washer. View enlarged photo + detailed drawing MARINE DOOR showing access door dimensions.